I had a terrible flight into KL. But that’s not about KL, it’s a whole different story. There is a longggg walk to airport from the airplane, and really lax immigration (my guy was on the phone the whole time). I would suggest booking your tickets into KL in advance, as buying them there is a bit strange. I booked my ticket though AirAsia going to KL Sentral but my boyfriend went before me and said to just get off the bus at Purdyura Bus Terminal. I asked if my bus stopped at both, they said no. I had to go in though domestic arrivals to buy a ticket (past police!, but they seemed to think it was standard) which cost 8 ringgits (2.5 USD). You might hear that Star Shuttle leaves every 30 minutes, and maybe they do during the day, but from 11:00 to 12:00 (midnight) there aren’t any. I bought my ticket at 11:03. Sad days. At least the airport has free wifi. You need to connect then open a web browser and click ‘search’ or something like that. 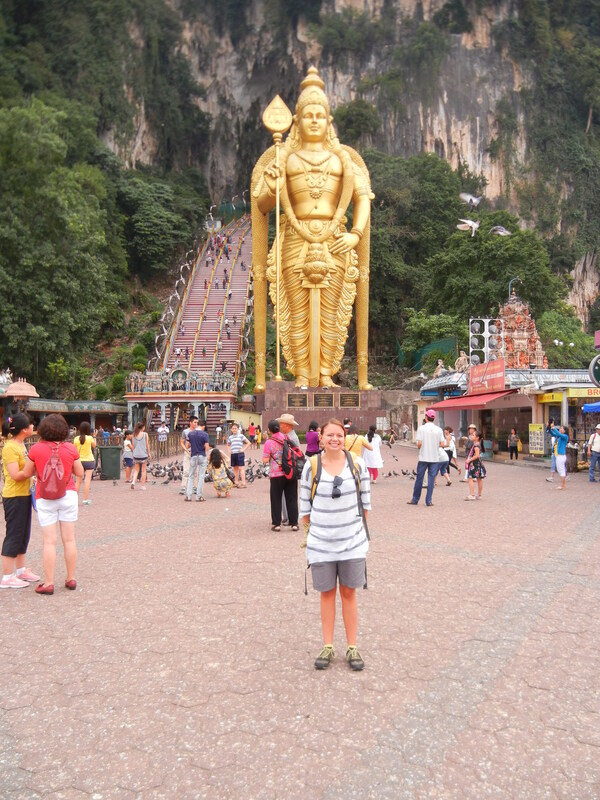 In the morning we went to the Batu Caves. After visiting the Batu Caves we went to KLCC (KL City Center) which is where the Petronas Towers are. After KLCC we walked about half an hour to Times Square, which is a mall/hotel/amusement park (they have Borders which I thought was out of business) that currently has a raffle going on until September 29th, 2013 to celebrate 10 years of being open. I thought by the name ‘Times Square’ it would be outside, like a park inside of a building and the building have the mall, but nope. 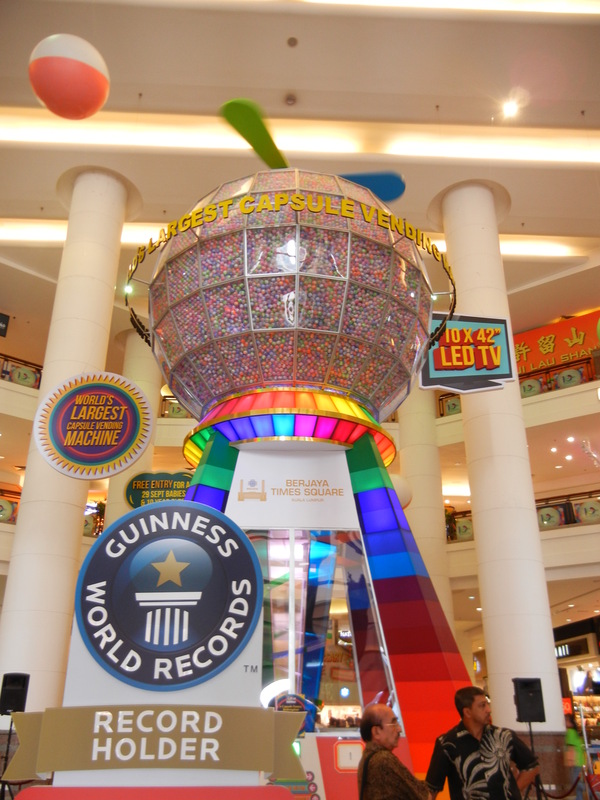 To enter the contest you have to spend 50 ringgits in one receipt and then you can get a capsule from the world’s largest capsule vending machine! It was on break when we got there. They allow 80 people to try from 12pm and 70 people to try from 5pm. Oh well. It’s always fun to explore a city on foot even if they don’t really want you to–half the walk ways have no sidewalks. From here we got food in the Bukit Bintang area (the heart of the Golden Triangle), which is mostly Chinese. This area has a lot going on at night. My asparagus with prawns had surprise mystery meat in it (I think some sort of pig), which for a vegetarian is sad, but for someone who lives in Asia, not surprising. We came back to this area for dinner the next day and everyone’s food was great–we shared a large ‘de-boned’ fish cooked in salt and pepper sauce (surprise! it was fried, and had two bones) and I also got asparagus again because we don’t have it in Korea! This time no surprise mystery meat, just cooked in garlic. 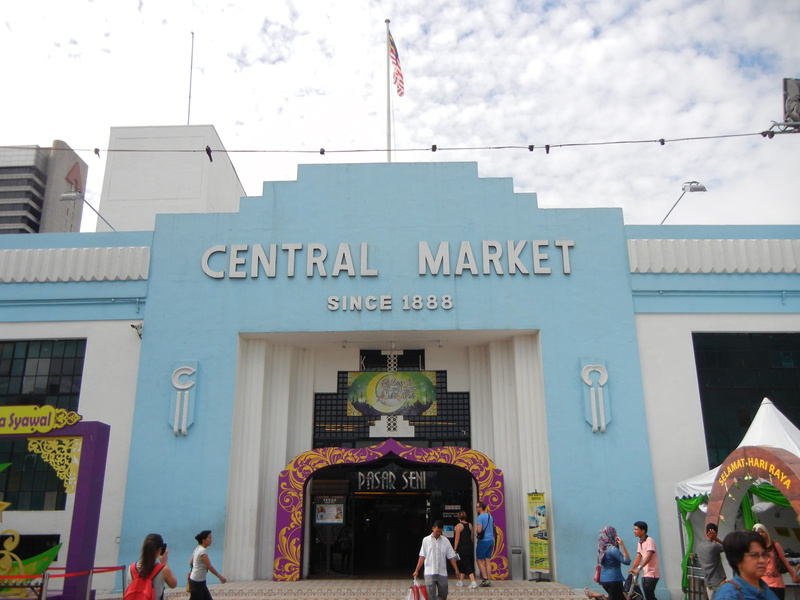 On our way back from Bukit Bintang in the afternoon we went to Central Market and Chinatown. 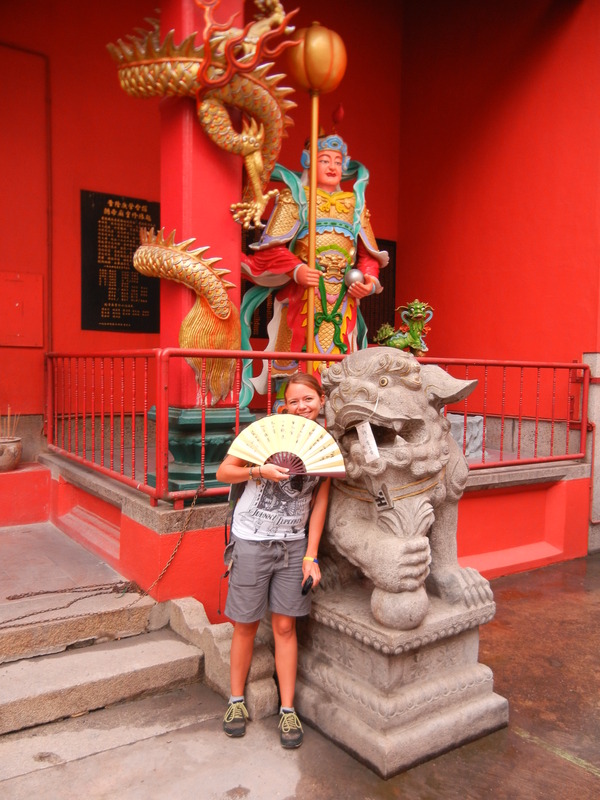 In the morning we went to a Chinese Temple called Guan Di Temple which was built in 1888. Guan Di is the God of War, however the temple also has the Goddess of Mercy, God of Prosperity and God of Education and Learning inside. There are many dragons, 2 protective warriors, and 4 protective creatures outside the temple. If you’re not a fan of incense you won’t last inside too long (like myself). 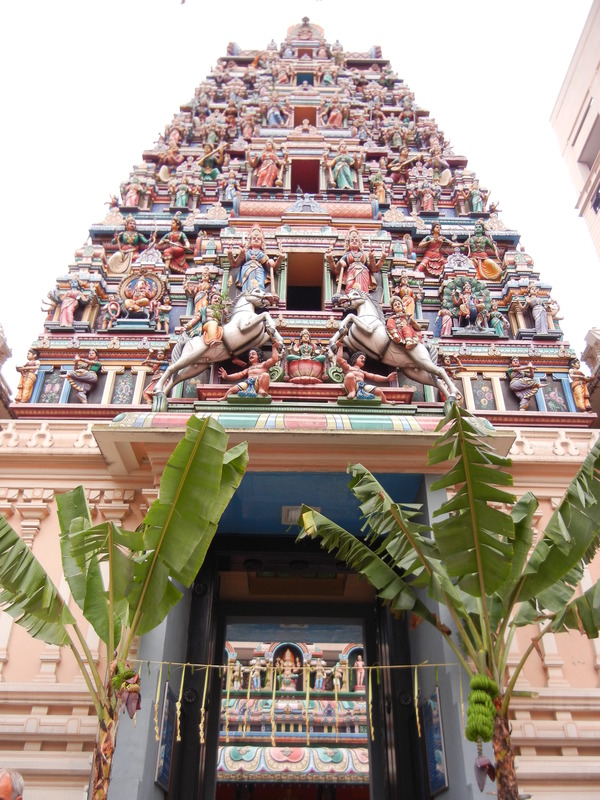 Across the street is an Indian Temple called Sri Maha Mariamman Temple, built in 1873. It was made public in the 1920s. Many gods are celebrated here. It is much more popular to go to than Guan Di Temple. I could hear prayers and chants from Sri Maham Mariamman from my hostel roof, 2 buildings away. Intense. After this we walked across the river going to another touristy area of Merdeka Square, where Malaysia claimed their independence in 1957. Coming from the south east, you will go past the textile house which is a very beautiful building, done in red and white in Islamic style. 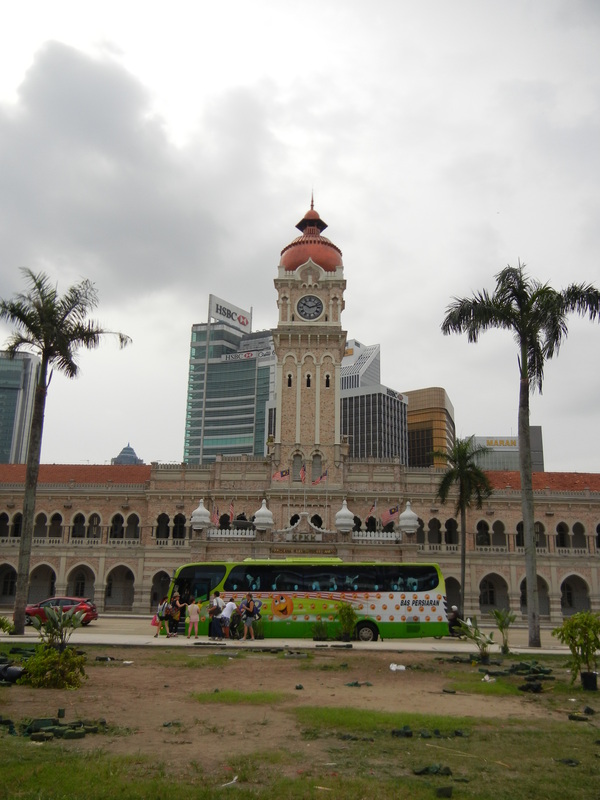 To the east is the Sultan Abdul Samad Building which has housed many things, but most importantly houses the most photographed clock tower in Malaysia. 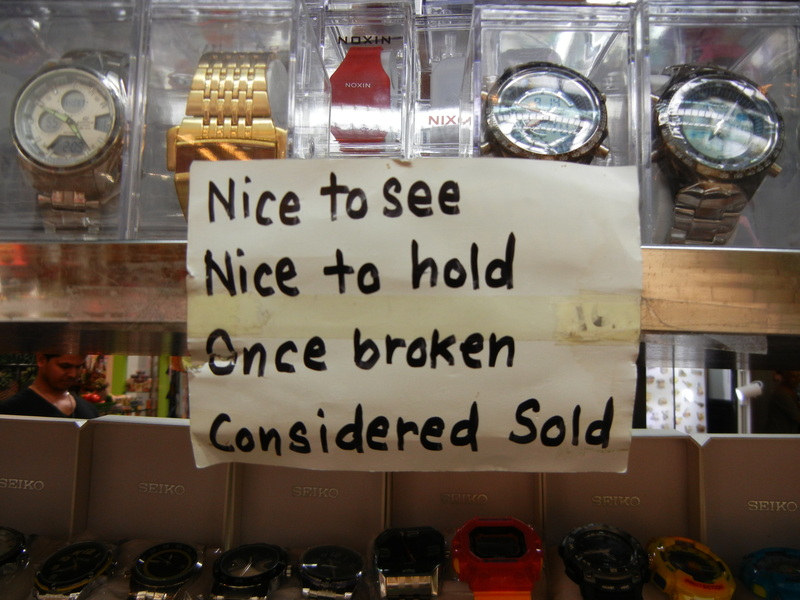 That was a big enough deal on the sign for them to write it. It is nice. We tried to walk to Masjid Jamek, a working Mosque but were turned away because we were wearing shorts. It seemed very beautiful. Walking back towards the square, we stopped at the fountain sculptures which have a lot of homeless people around them. Going back towards the square, we walked past The Royal Selangor Club which is a traditional British building; it has a Long Bar inside which only allows men. From here we reached the Flag Pole which is 100 meters high. Continuing along we came to the I ❤ KL sign which is outside the City Gallery. They had some great new photos, which I think you could vote for using your phone, and a 50 ft wide model of what the city will look like by 2015, when they plan on finishing a taller building than the Petronas towers. The model did night and day and had a tourism video playing in the background. I wasn’t listening too much as I was just trying to get photos of the model before the lights changed. Other than that, the City Gallery sells souvenirs. I got a free phone key-chain for liking the facebook page. This was when we really started to have problems. 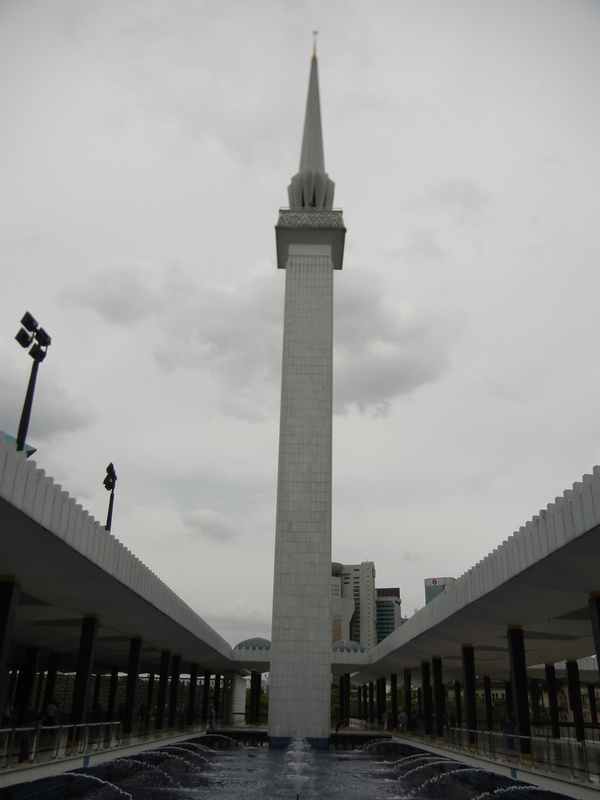 We thought to walk to the National Monument. This is a popular bike route, and we could see why after we started it. There is no where to buy water or snacks and it is HOT in KL. Not humid though, so it felt better than Korea. According to GoogleMaps, the walk is 1.9km, and should take 25 minutes. When you only have warm water and have already been walking all day, this is a lot and feels a lot longer. Now I feel like we were just complaining. The walk is surrounded by park, so at least it is not bad scenery, if you don’t look into the stagnant pond. We ran into this same problem of no water or food shops again when we walked though the Perdana Botanical Gardens, Parks, and Museums and around the KTMB HQ. There could just be guys selling water or other drinks from stands and this problem would be solved. 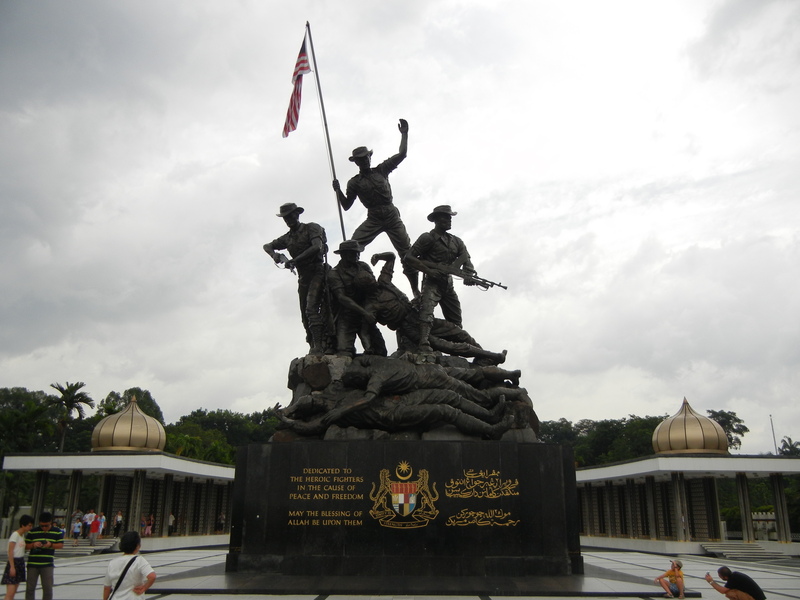 The National Monument is interesting….Men celebrating on a pile of dead bodies. The area around it is beautiful with other statues and 3 domes. From here we walked though the Perdana Botanic Gardens,Parks, and Museums–which is just a large park with many different areas. Waterfalls are not all as they appear on signs (small and man-made). The Amphitheater is huge, as is the Bird Park but we didn’t want to go into the Bird Park and nothing was on in the Amphitheater. The Orchid Garden is beautiful and free. 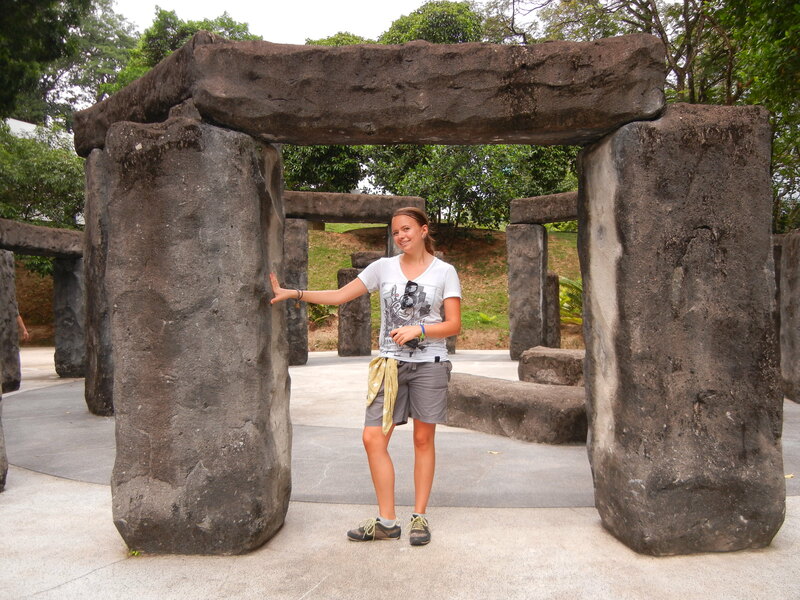 They have many different kinds from all over Malaysia, which has over 200 different species of orchids. I guess they don’t have (or I didn’t see) my favorite which is a spider orchid (and which my parents also found randomly growing in the backyard in Florida). Continuing in the park, we went past the Planatarium which had at least 3 mini traditional and famous time keeping devices/buildings/structures from China (not sure), England (Stonehendge) and India (Jantar Mantar). We got to touch them! Finally! After more walking, getting lost looking for food, realizing where we were, getting food, and going back to the National Mosque it was 2:45 which was prefect for going in at 3:00. There was a bit of a line but we still made it in the first group in–they did run out of covers for men and women. Covers are necessary if a woman shows her legs (they have different covers which are just head scarves for little girls) or if a man’s shorts are above his knees. There was a lot of information inside and the man telling people about the temple seemed so happy to be doing so. From the roof, there are 16 funnels for water, which lead to one in the main prayer room which cleans water for the washing before and after prayer. Woman are not allowed into the main prayer room. The building can hold 1,500 people for prayer time. There was also a few informative posters, including one showing that Mohammed is basically Jesus’ cousin, which included the Muslim names for the same people that Christians believe in (Adam was still Adam but Eve had another time). There are some tombs in the back, with 3 empty spots. Overall, KL has some steps to take in cleanliness and homelessness, but the touristy areas are pretty clean and taken care of. Walking is not suggested (but I’d do it again because that is the best way to explore!) as some places don’t have sidewalks and there are no posted maps or tourism signs to help you find your way. On our way back from Bukit Bintang in the afternoon we went to Central Market, which is a market where you can hopefully work the prices down. It was opened in 1888, and saved in the 1970s. We didn’t buy anything there, but there is also a lot of food in the area (some good–Restournt Youssif, if you don’t count the weird things we found in our food, which might have been for flavor but we had no idea what they were–and some bad–the gelato with a panda on the logo had frezer-burn on the gelato and she wanted to put it into a sandwich??) Most of the items for sale are knock-offs, made of wood, souvenirs, or Indian clothing. Before dinner we went to Chinatown and go some great knock-offs–I’m starting to think they are real but just had a minor defect so the companies cannot sell them i.e. sunglasses with paint chips or T shirts with the logo on the inside but the design on the outside. The sellers don’t try to tell you that the items are real like in China, nor do they try to make you feel bad by saying that their family will starve, again, like my experiences in China. 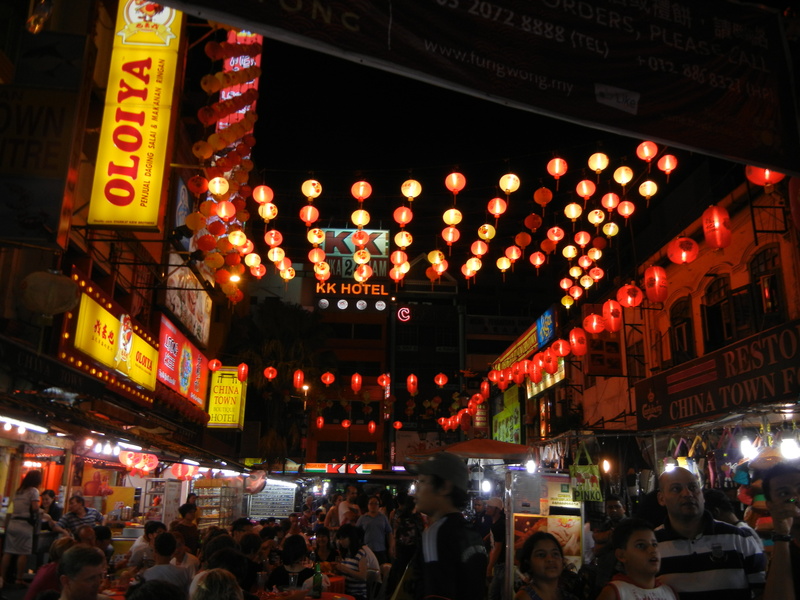 We met some friends at their hostel and walked back to Petaling Street which has a beautiful gate to start the market. This area also has amazing food, and I think the best I ate in KL. I got bok choy and noodles and both were fantastic (and totaled 15 ringgits). Everyone was stuffed, I think with me being the only one who finished. 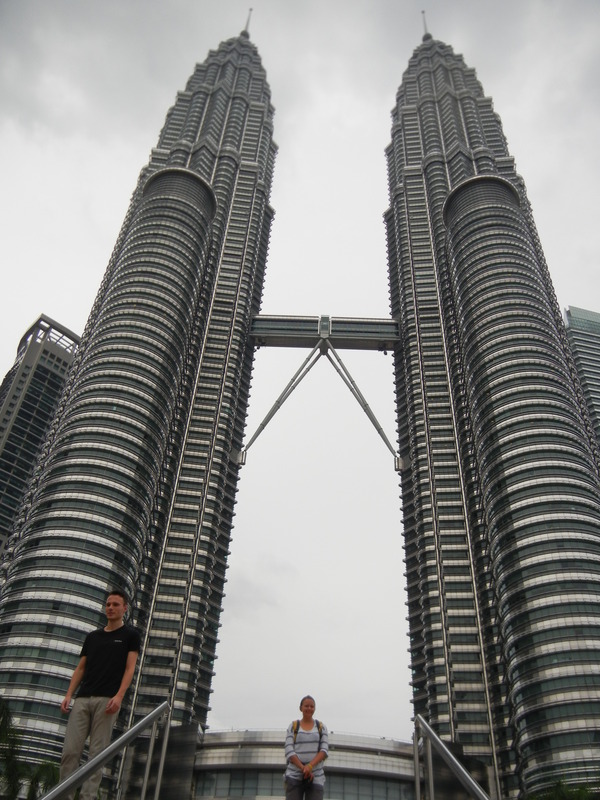 After visiting the Batu Caves we went to KLCC (KL City Center) which is where the Petronas Towers are. 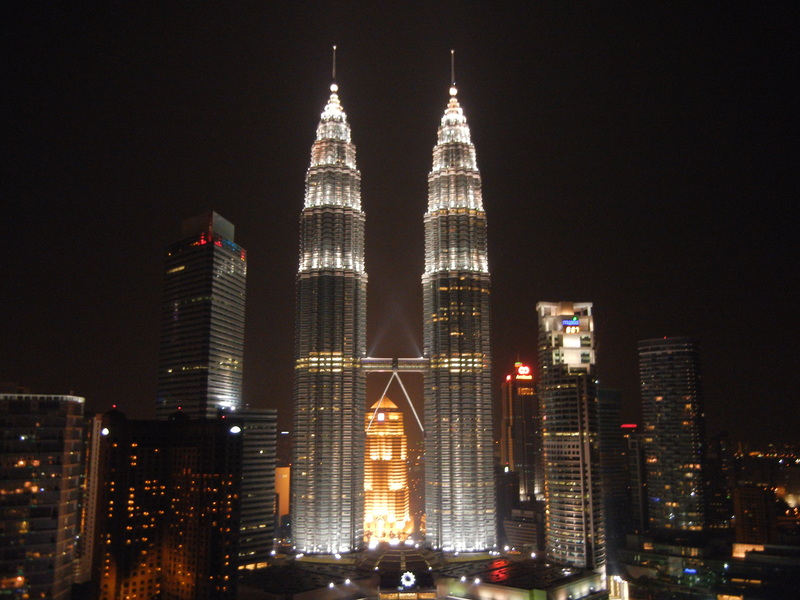 They were built in 1998, and are 452 meters tall. The sky bridge (the highest you can go up)is about halfway up between the 41st and 42nd floors. The subway is above ground at points and you can see grafitti along the river. It costs 1.60 ringgits to get from KL Sentral to KLCC. It’s hard to get pictures of all of the Petronas Towers with someone in them because they are so big and there are tons of people in the area. From the park side we were able to get more, but not the bottom of the towers as there is a mall there on the park exit side. The park is 100 acres! It has an area for kids and a tropical garden area. The malls there have everything! Topshop–I was told they were only in Asia in HK–Marks & Spenser with some food and Aunt Annies Pretzals! We came back to this area at night to go to Skybar on the 33rd floor of Traders Hotel. If you want to reserve a window seat you need to call in advance, but keep in mind you should be a nice person then and let people keep squeezing in to take pictures. We weren’t able to make reservations, but luckely the people near us by the window were super nice and even told us that the top window was open! No marks on your photo from the lights inside. Drinks are expensive but you pay for the view, so we got a bucket of 6 Tigers for 24 ringgits each (the night before in Chinatown we got 3 Caslings for 16 ringgits each) around 6:45, stayed for sunset around 7:30 and left for dinner. They don’t ever let you have a tab at the bar, so be ready to pay when your drink(s) come(s). I feel like the building in the middle gets no love, but it highlights the towers! In the morning we went to the Batu Caves. The KL Kummuter costs 1 ringgit there are 2 ringgits back (that’s how they get you!). It takes about half an hour and leaves every half hour. 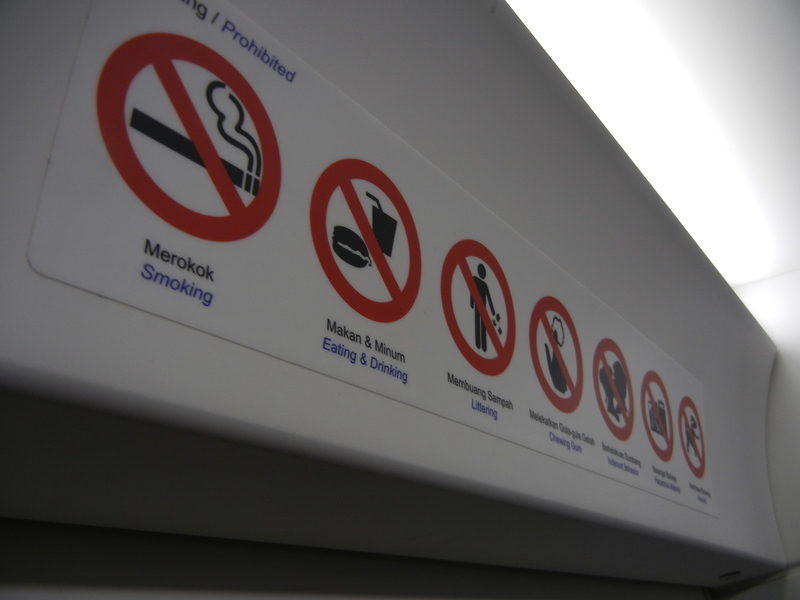 No kissing on the trains! After we bought tickets there, I learned that the minimum wage is 5 ringgits an hour. If you work for one hour you can take a KL Kummuter from KL Sentral and back but not much more. Keep that in mind when things don’t seem to work properly, like only having one working gate taking tickets, or no working gates and just a guy taking tickets. Upon arrival at the Batu Caves, you will have to cross a round-a-bout/rotary/traffic-circle/circle/whatever-you-want-to-call-it and then you can go straight in, past a few people trying to sell souvenirs and hats. 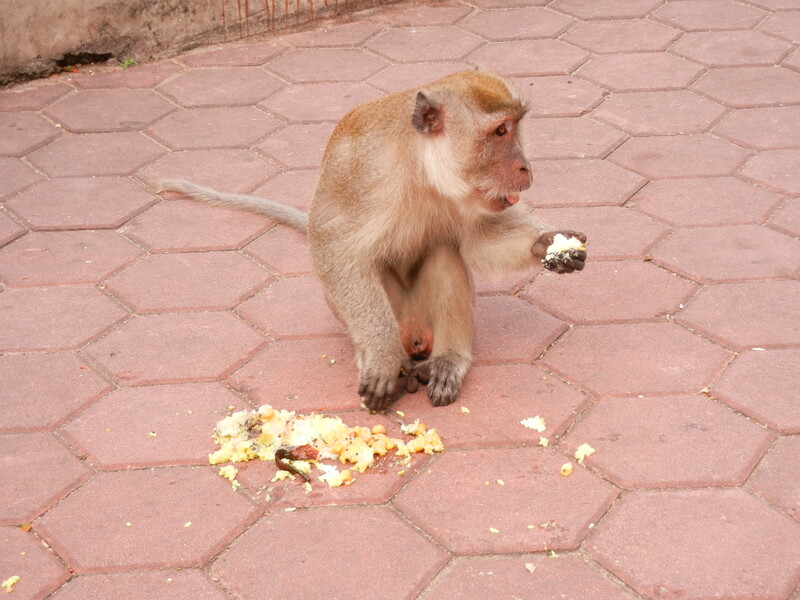 There is a huge green Hanuman (monkey god) right past the first gate, and this was where we saw most of the monkeys. 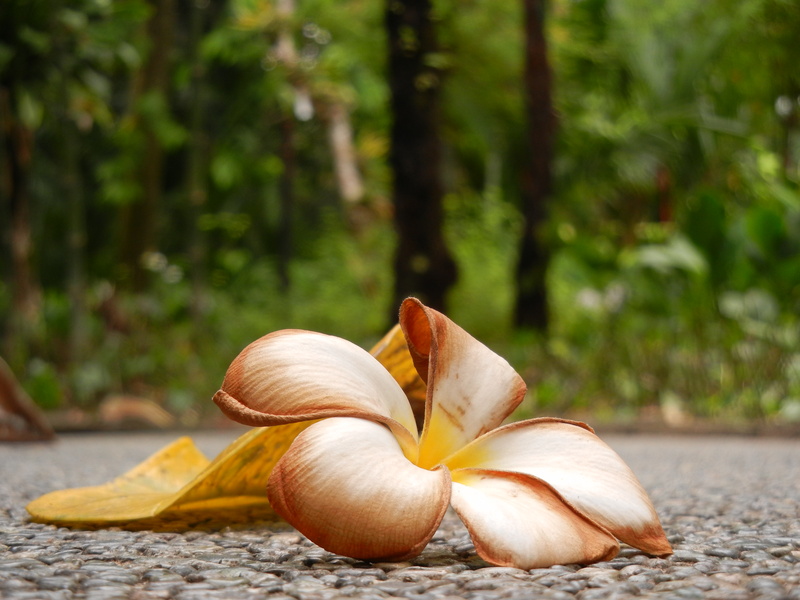 Many people gave them coconuts, but some were dumpster divers and pulled a bag of what looked like scrambled eggs out of a trash can for many monkeys to eat. There were even some babies attached to their mother. One shrine is right behind Hanuman, and another is in front to the left and up some stairs. Going past the little stairs, you will come to a pond with a fountain, and a parking lot for tour groups across from the huge golden statue of Hanuman. There were tons of pigeons there as well, and tourists were making them go crazy–shouldn’t they be used to it like the monkeys? From here, you can go up the stairs (260 steps) to the top to see the real part of the shrine, which is also filled with monkeys. You can go into the cave and there are two (?) shrines (and many more statues which could be shrines as well) and one you have to pay for. We did not do that as we could see into it and have no religious reason to go there, where people seemed to be praying heavily. On the way back down the steps we stopped by the Dark Cave (to the right). It was recently conserved more and you can take a 45 minute tour or a 3 hour tour. We decided against that as that cost money and you probably would not be able to see much–it IS really dark, they have to give you a torch/flashlight. After finishing the climb back down we tried some of the Southern Indian food there, and were not too impressed–either I don’t like Southern Indian food, Rawa Thosai (Onion Pancake), or the shop we went into (and probably the others as well) figured they didn’t have to try too hard at the tourist attraction. They also insisted on giving us chicken which we didn’t want and then charged us for it. I’d say don’t eat in the area and go for something more centrally (sentrally?) located. Next we went to the KLCC.